Sweden has voted decisively to reject the euro in a referendum overshadowed by the killing of Foreign Minister Anna Lindh. The final result shows 56.1% voting against the euro, with only 41.8 in favour, on a turnout of 81.2%. Prime Minister Goeran Persson conceded defeat on Sunday evening, saying he was "not surprised" by the failure of his pro-euro campaign. 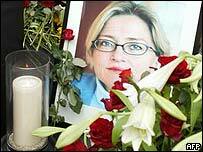 Lindh was the main face of the Yes campaign, and most opinion polls after her stabbing in a Stockholm department store showed support for the euro rising. However, the No side was able to hang on to the majority it had right through the campaign. The BBC's Chris Morris in Stockholm says Sweden may vote on the euro again, but is now likely to remain outside the eurozone for at least a decade. Opponents of euro membership in Britain and Denmark - the other two EU countries outside the eurozone - will take heart, he adds. The result means that the euro has failed its first test since the new notes and coins were introduced at the beginning of last year. But the EU said in a statement that the euro had brought advantages to the eurozone economy, providing "much-needed stability" in member-states' economies. It added that it was confident that the Swedish Government would "keep the euro project alive in Sweden". All of Sweden's main political parties were campaigning in favour of euro membership, along with the business community. However, the No camp struck a chord with voters by pointing out that Sweden had higher growth and lower unemployment than the eurozone. It also benefited from fears that euro membership could lead to the erosion of Sweden's generous welfare state. Both the Yes and No sides stopped campaigning after Lindh was fatally stabbed on Wednesday, and both promised to respect the result of the vote. Mr Persson said the result was easy to accept because the margin of victory was convincing, the turnout was high, and the issues had been thoroughly debated. He added, however, that the timing - with some eurozone countries having difficulty controlling their budget deficits - had been unfortunate. Lindh, aged 46, was one of the country's best-loved politicians, and a rising star who many thought could be the next prime minister. Her death on Thursday prompted an outpouring of grief, including a rally against violence which was the biggest demonstration in Sweden since the Vietnam war. As voters cast their ballots on Sunday, police released a new image of a man they want to interview in connection with Lindh's killing, showing his face clearly for the first time. 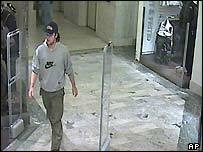 The photograph was taken by security cameras in the department store moments after she was attacked. Police are also looking for 10 other people whom they say have a record of violent crime. They believe the killer has offended before, and may be psychologically disturbed. The case has awakened memories of the murder of Prime Minister Olof Palme in 1986, on the same street. In that case, police never managed to catch the culprit. In this case, they have a murder weapon - the killer's knife, which was discarded near the scene of the crime - but its grooved surface has prevented them from taking fingerprints. German and British laboratories have been asked for help with DNA tests on the clothes believed to belong to the killer. "Swedes rejected the euro by a thumping margin"
"I'm sad but it was a clear message and we will follow it"